The Canadian World Education Foundation Tanzania (CWEF TZ) is a Canadian non-profit NGO that provides educational sponsorships to vulnerable children in Tanzania. Out of Tanzania’s 41 million people, 43% are less than 15 years of age1. In 2011, an estimated 1.3 million HIV/AIDS-orphaned children were between the ages of 0 and 17.2 Traditionally, orphaned children are absorbed into extended families. However, the increased numbers of HIV/AIDS orphans are over-burdening this system. This leads to increased placement in orphanages, even though institutionalized care is outside the cultural norm in Tanzania. Additionally, there is controversy over whether orphanages are able to satisfy the complex needs of HIV/AIDS orphans. Particular concern has been generated about the consequences of separation from siblings, family, and the community3. 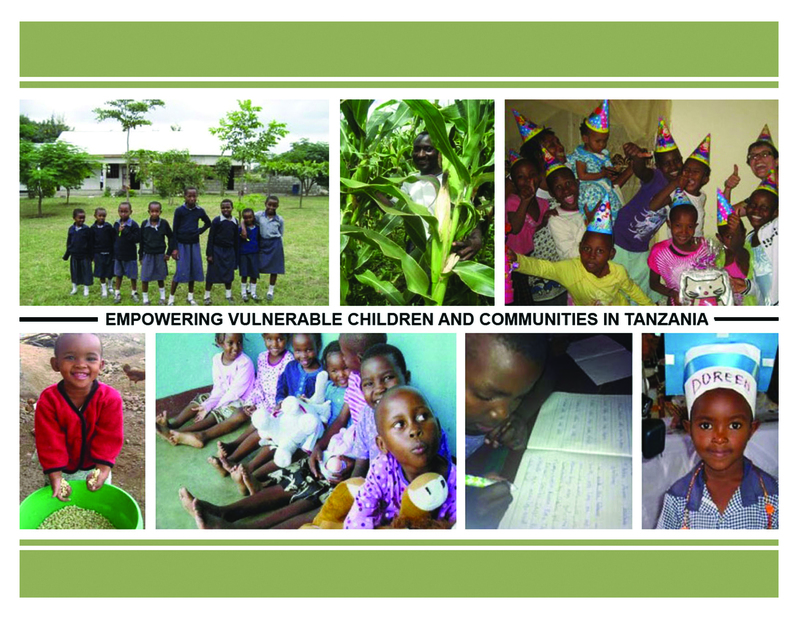 CWEF TZ, working in partnership with the Saidia Agriculture and Social Care Organization (SASCO) in Tanzania, stands apart from other education sponsorship programs in addressing these issues. Through the operation of sustainable, income generating initiatives such as agriculture and small business, children receiving sponsorship also receive financial support for food and other basic needs. This lessens the burden on extended families to accept orphaned children into their home. It also makes it possible for single parent households to keep children in their care. Vulnerable children who remain in their families receive the benefits of a lower caregiver-to-child ratio, and are raised within their own religion and family customs. Of course, there are some benefits to living in an orphanage centre. Research conducted by Julie Caron (CWEF Tanzania), Dr. Kevin Chan (Hospital for Sick Children) and Dr. Paul Chaote (District Medical Officer, Kilimanjaro Region) identified that children who live in orphanage centres were considerably more educated, aware and comfortable discussing HIV/AIDS methods of transmission, prevention and antiretrovirals. When discussing HIV/AIDS, children living with extended families demonstrated their discomfort by averting eye contact, moving into a closed posture, softening their voice, and shifting in their seat. It was noted that the attitude toward educating children about HIV/AIDS differs considerably between orphanages and family care. In addition to HIV/AIDS education being given in schools and at the clinic, orphanage centres are reinforcing positive health messages. “When we get a specialist come to visit us, maybe a doctor or a nurse from abroad, we draw knowledge from them and give it to our children,” explains a director at one of the local orphanages. “Most of our volunteers are medical students … [D]uring their stay 4 weeks with us, they have to conduct seminars with our children”. As a result of this research, CWEF TZ and SASCO are working towards constructing a community centre at which public health programming can be offered, in a similar way, to children in the community. Another unique aspect of CWEF TZ’s program is the formulation of a strong, enduring bond between the sponsor and the student. This bond reinforces for the child that there is someone who believes in them enough that they are willing to invest in their potential. This can make an invaluable difference in a young child’s life, especially for orphans who lack parental support. CWEF TZ, in conjunction with SASCO, acts as an intermediary for sponsors. In particular, these organizations: provide a profile of the child’s personality, interests, and ambitions; facilitate written correspondence between sponsors and their children; and provide report cards. Overall, CWEF TZ tries to avoid short-term sponsorship that would prevent this bond from developing and would leave the child’s educational future in doubt. The child is committing to education; a sponsor should commit equally to the child. Recent literature has shown significant reduction in negative health outcomes when communities become their own agents of change. In particular, there is a belief that positive change occurs through increases in capacity, self-determination and the empowerment of the community as a whole4. As such, CWEF TZ believes that the people best situated to make a difference in a community are the people within that community. The key is facilitation, not direction. CWEF TZ has strong connections to the community through close partnership with SASCO. SASCO is a registered Tanzanian NGO created by Tanzanians for Tanzanians. SASCO’s Board of Directors consists of men and women dedicated to providing a stable life for vulnerable children in communities across Tanzania. Furthermore, local organizations and local government authorities including village elders, community leaders, and the Social Welfare Department are involved in identifying candidates for sponsorship. They often focus on children with academic potential and the desire to give back to their village. It is these students who, when given an opportunity, will become community leaders and initiate positive change. The goal is simple: to give children the freedom and choice life failed to provide. CIA World Factbook. “Tanzania”. 2012. https://www.cia.gov/library/publications/the-world-factbook/geos/tz.html. Last accessed July 9, 2012. The Stephen Lewis Foundation. “Stephen Lewis Fact Sheet: Children and HIV/AIDS” http://www.stephenlewisfoundation.org. Last accessed July 9, 2012. Morantz G and Heymann J. “Life in institutional care: the voices of children in a residential facility in Botswana”. AIDS Care: Psychological and Socio-medical Aspects of HIV/AIDS. 2010: 22(1): 10-16. “The Jakarta Declaration on health promotion in the 21st century.” Health Millions. 1998; 24: 29-30.